Click/Tap: Image to view the series of labeled images. Index to display the image set. This web app presents canine planar anatomy, displaying 900 by 600 pixel views of cadaver slabs obtained by cutting frozen cadavers with a bandsaw. The head/neck, thorax, and abdomen/pelvis are shown in three planes: sagittal [left to right], transverse [rostral/cranial to caudal, caudal views], and dorsal [dorsal to ventral] views. A sagittal plane divides the cadaver into right & left parts. 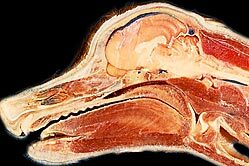 A transverse plane divides the cadaver into cranial/rostral & caudal parts. A dorsal plane is cut parallel to the back, dividing the cadaver into top (dorsal) & bottom (ventral) parts. 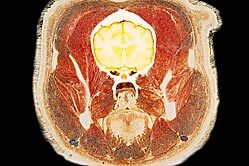 The significance of planar anatomy has increased with the importance of planar imaging technology (MRI & CT) for clinical diagnoses. 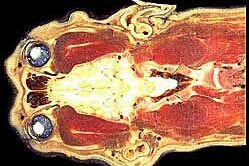 The images displayed in this web site were obtained in the process of authoring: Feeney D.A., Fletcher, T. F., and Hardy, R. M. 1991 Correlative Imaging Anatomy of the Normal Dog. Ultrasound and Computed Tomography. W.B. Saunders Co., Philadephia. Navigation Note: Keyboard arrow keys may be used to navigate among images per plane per region. Use the keyboard spacebar or click/tap an image to toggle labels.